…home of the award­-winning Tomato­-Zucchini Frittata (1st Place – 2014 West Cape May Tomato Festival) and the Mozzarella Stuffed Meatballs (1st Place – 2016 Meatball Competition at Willow Creek Winery) and Best Decorated Sign at Christmas (1st Place – 2018 Light Up Cape May). This Colonial Revival bed and breakfast in Cape May, NJ with its large wrap-­around porch was built by Luther Ogden in 1900. He owned the family lumberyard and used American chestnut for all of the interior pillars, ceiling beams and wood trim. 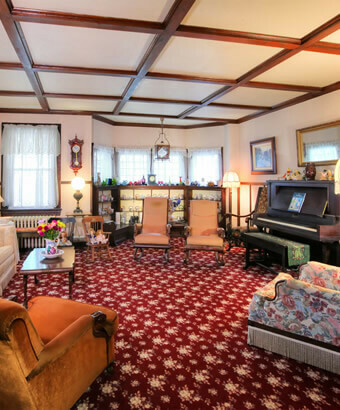 The first floor features a large living room with built­-in bookcases, and a sitting area with its original fireplace, as well as a dining room with a fireplace. 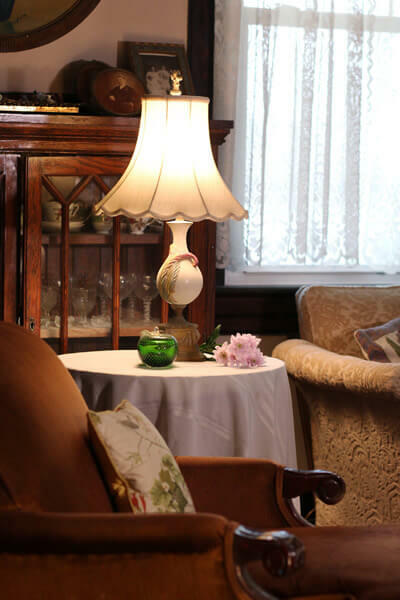 This turn-­of­-the­-century inn is particularly noted for its beautiful antique lighting fixtures and cranberry glass chandelier. 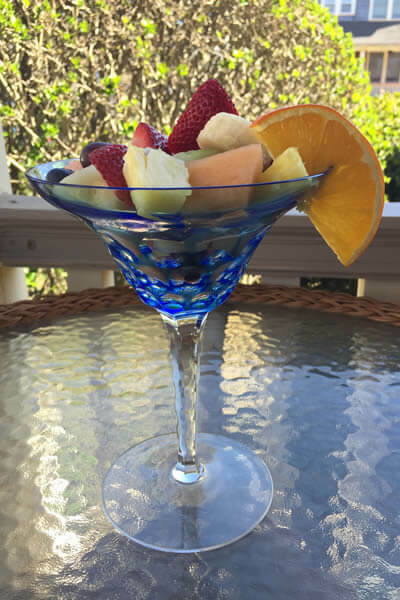 In summer, our guests enjoy both a sumptuous, homemade breakfast as well as refreshing ocean breezes as they dine on the prettiest wrap­around porch in Cape May. 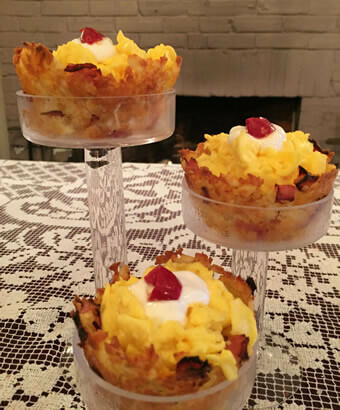 Our recipe for Breakfast Cupcakes was featured in the 2016 Chamber Of Commerce of Greater Cape May Visitor’s Guide. In winter, a fireplace provides a cozy touch in the antique­-filled dining room. The inn is located in Cape May’s historic district and is just one block from the beach and 3 ½ blocks to the Victorian walking mall. Our parking is onsite and free! The Luther Ogden Inn was named to the 2012 Green Festival Honor Roll for its commitment to sustainability and the environment. We also received the 2013 Conservation Award from the Cape May County Chamber of Commerce as well as the 2015 Eco Award – Green Cape May from the Chamber of Commerce of Greater Cape May. We accept bedandbreakfast.com gift cards and gift certificates. 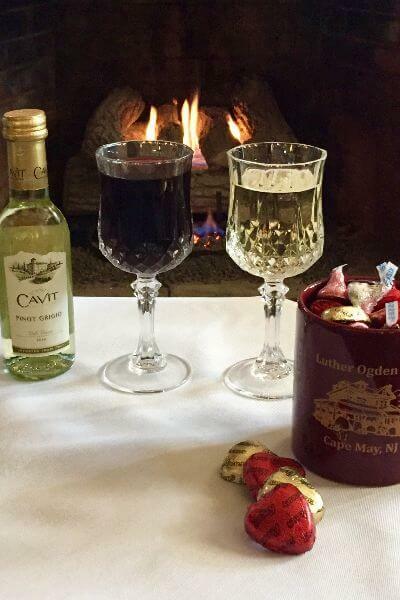 Cape May is truly a resort for all seasons. Whether you enjoy music, fine dining, biking, theater, architecture, history, wineries, craft breweries, distilleries, trolley tours, or relaxing on the beach, Cape May has it all. In 2015, Cape May was selected as the “#1 Top 10 Most Beautiful Coastal Towns in the US” by CultureTrip.com. Conde Nast named Cape May as one of the “Top 20 Best Food Cities in America”. In 2017, Coastal Living selected Cape May as one of the “Top 25 Best Beach Towns in the US”, and msn.com named Cape May as the “Prettiest Town in New Jersey” as well as the “Most Adorable Small Town in New Jersey”. Cape May was the NJ pick for “50 Beautiful Small Towns We Want To Live In” by House Beautiful and “The Best Summer Vacation Spot in NJ” by businessinsider.com. GoodHousekeeping.com named Cape May as one of “The 46 Best Beach Towns in America”. The Arbor Day Foundation recognized Cape May as a 2016 “Tree City USA”. Cape May is the NJ pick for “50 Best Small Towns to Visit in the Winter” and one of “The 25 Most Festive Holiday Towns”. Cape May also received “The Small Town in NJ That Transforms Into a Magical Christmas Wonderland” designation. 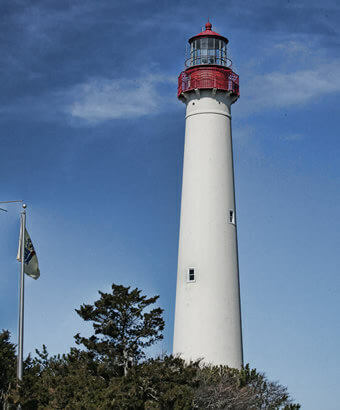 In 2018 Expedia users selected Cape May in the “Americans Pick Their Favorite Destinations” contest. Bestproducts.com picked Cape May as one of the “50 Most Beautiful Beaches for a Getaway”. Cape May Rotary Park was selected as the Best Christmas Tree in NJ by Best Life. The Travel Channel named Cape May as #3 in the Top 10 Best Beaches on the East Coast.